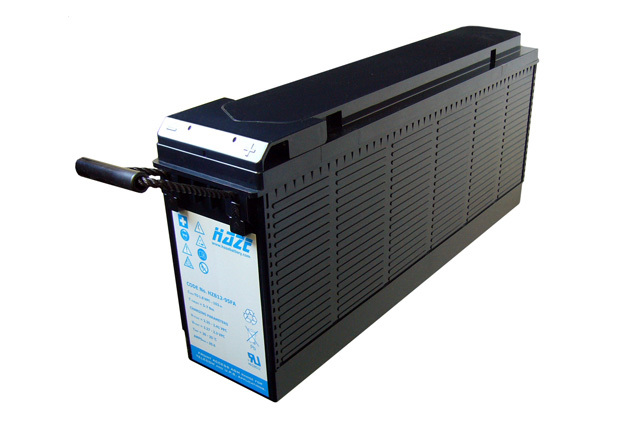 Offering a compact, power dense design, the Haze HZB12-80FA is a high specification valve regulated lead acid battery designed for standby power systems. As with all the Haze HZB FA catalogue, the HZB12-80FA is a front terminal battery designed to meet with BELLCORE recommendations. Providing all the benefits of a front terminal arrangement this battery offers a simple, clean installation and avoids to need to reach over batteries to make an inter connection. The front terminal feature is also of great benefit for ongoing testing of the batteries as all readings can be taken directly from the front of the battery cabinet or rack enclosure, saving time and money as well as being a great safety feature. The footprint of the Haze HZB12-80FA is minimal and ensures great advantage in applications and environments where space is at a premium. The case is constructed from tough ABS plastic, and can even be supplied in a V0 rated version upon request. Blue Box Batteries offer the complete Haze product series, and are well placed to provide the most competitive prices and service available. If you are looking for the best solution for your standby power requirements then simply call Blue Box Batteries today on 02381 789197, as well as Haze we supply industrial batteries from all major battery manufacturers for the best choice possible. DESIGN LIFE 12 YEAR DESIGN LIFE (EUROBAT GUIDE - 10-12 YEARS). SEPARATOR ABSORBED GLASS MAT (AGM). CASE MATERIAL ABS AS STANDARD - V0 AVAILABLE ON REQUEST. STANDARDS COMPLIES WITH IEC 896-2, DIN43534, BS6290 PART 4, EUROBAT.